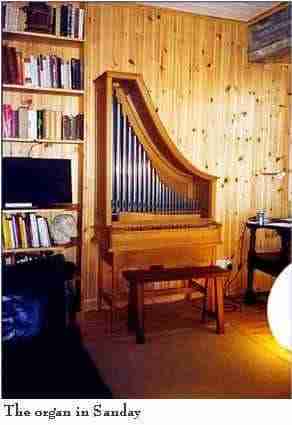 Some 15 years ago, we built a small chamber organ for Peter Maxwell Davies in his crofter's cottage on the Orkney island of Hoy (famous for its "Old Man", the monolithic stone on the coast only first climbed, I believe, within our living memory, but now climbed regularly). 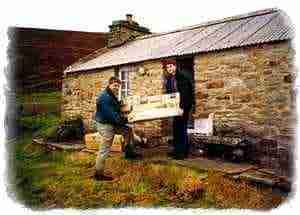 Max's crofter's cottage on Hoy was about as small as you could get. Originally it had been two rooms, one of which was the kitchen. These crofters cottages were for whole families. The family would sleep in a large cupboard-like enclosure (with doors that closed when everybody was in bed) to keep warm. 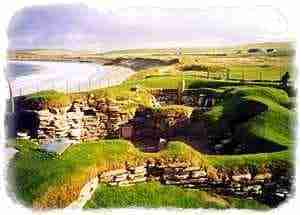 The walls were made with flat stones hewn roughly to shape piled on top of each other without any mortar. So the wind whistled through, and it must have been unbearably cold. Heating was with peat, of course, and there were two chimneys, one at each end of the house, down which also came the wind and the rain. Life in these houses must have been extraordinarily hard. 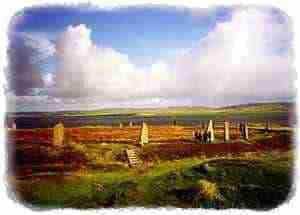 The climate is not particularly hospitable and yet, on the main island of the Orkneys, is one of the oldest settlements (in remarkably original condition) of the whole of Europe. So the cottages were small for a reason, to try and keep warm and dry (the latter a pretty forlorn hope in fact). 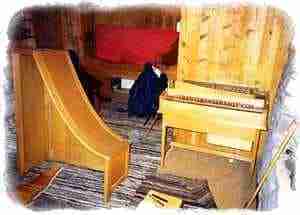 The organ therefore had to be small as well and of such a shape that it would fit under the eaves of the cottage which fell to about 4' 6" where the roof met the walls. The key compass was 8ft F to top f, 49 notes as there was not really room for more. Peter Maxwell Davies sometimes uses the organ for playing through the music he has composed but (surprisingly to some) he actually does all his composition in his head. So he uses the organ for pleasure rather than actual composition. Oh yes, and the cottage was then about 1 1/2 miles from the end of the road, and it had to be carried the rest of the way, which was another good reason for making it small. 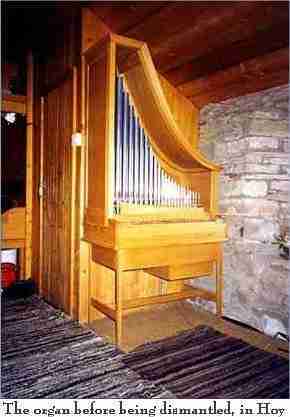 But now Peter Maxwell Davies has moved to a new and somewhat larger premises on Sanday, almost the most northerly of the Orkneys, so the organ had to be moved too. I flew up to Aberdeen on a plane at about 7.00am, changing there to a smaller plane to fly onto Kirkwall where I hired a car and went to the house of good friends of PMD, the Bevans (for lunch and to pick up the keys), whom I last saw 15 years ago when the organ was delivered. From there the ferry to Hoy (through the Scapa Flow, of course - I was tempted to suppose that the word scuppered came from there and the simultaneous scuppering of the Imperial German Fleet there after WWI, but the word is 19th century or older) and on to Rackwick, an enjoyable drive as the visibility was good, and I even took some photographs of the dramatic scenery. 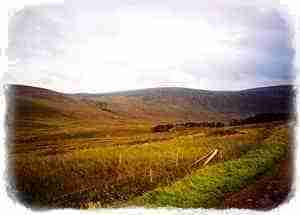 I found Rackwick (I have only been there twice before, a long time ago and driven by somebody else) but as there are effectively only two or three roads on Hoy, you can't really go wrong. It was an enjoyable 35-minute drive. 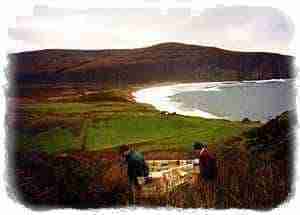 At Rackwick I was met by Hutch who offered me a cup of tea. Hutch still has no mains electricity in his cottage, relying on gas cylinders for cooking, peat for heating and an old wind generator for low voltage electricity hooked up to batteries for his television, lighting and radio. From there up the steep hill between the sheep to PMD's cottage, opening the door, looking around, and then another trip for the blankets and tools. At that point the first (and only really major) problem presented itself. The key for the padlock to the outhouse was the wrong one. (Maybe it should be explained to our American cousins that an outhouse usually contains, as in this instance, what they euphemistically call a bathroom. I don't think that Americans will believe that most Brits over about 50 will remember outside loos only too well.) Anyway, nothing that could not become overcome with a screwdriver, the which I had of course - for the hasp of the padlock. Having got there I played the little organ for a few minutes, long enough to establish that 13 years after the last tuning, one was a bit due and the leather hinges of the keys were rather worn and floppy. It seems the organ gets used. And then to dismantling. This was actually an instrument I had designed all those years ago, so I had a rough idea as to how it was to be taken apart. I worked away until about 10.00pm, then it was time to eat; and, the nearest pub being too far away, it was do-it-yourself. With a peppered steak (best Scotch - guaranteed BSE-free) with courgettes, carrots cut up and stir fried with wine and cream and rice, and a tomato salad with a sauce concocted out of what I could find, I was suitably revived to continue with the dismantling which was more or less done and packed by 1.30am, the top part of the case acting as a case for the pipes, the rest all well wrapped; and when the wine was finished, I was tired enough to go to bed and sleep in the cupboard. Next morning after a hearty breakfast, the Bevans' son and grandson came up to help with the carrying of the organ to the car which we did and then had lunch (remember, the car is not parked outside the house). We had lunch and a beer, and I then set off to visit somebody else I remember from the original installation and met Hutch again on the way down, very fortunately, as he was aware of the time of the ferry. I was just assuming we had time as I knew Graham Bevan would be on the same one and he had not left the house. However, what I did not know was that he had mixed up the ferries, and it was then that Hutch pointed out it was 32 minutes to the time the ferry left, I was supposed to be there 10 minutes before it went, and it had taken me 35 minutes to get from the ferry to the house (admittedly, dawdling). The ferry had to be got as the next one was not until Monday (this was Saturday), and the whole operation had to run the way it was planned, as I was going to Athens the Thursday after the planned return on Tuesday. I got to the ferry in 17 minutes and will say no more. Graham Bevan had by this time realised that we did not have much time and chased me in his car, getting ever more concerned that I had taken the wrong turning when he did not manage to catch me up. 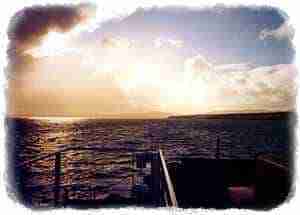 On the ferry, to Stromness, and a good meal with the Bevans and a good night's sleep too. Next afternoon I was due for the ferry to Sanday (over two hours' travel time away) and I took the opportunity to have a look at the old settlement I mentioned above which is fascinating; I suppose it is bronze age, a complex of cut and cover tunnels joining a number of equally cut and cover style dwellings with the now somewhat encroached sea whipping a stinging spray into our faces. A quick visit into St Magnus at the end of the service to look at this wonderful Norman building and a look (but not listen) to the Willis it contains and then onto the ferry, arriving at Sanday at about 4.00pm and then to PMD's house. It would seem that Sanday has only one real road so one can't really go wrong unless you go past the house, in which case you finish up in a large farm, surprisingly large and with a fine house right on the northern shore of Sanday, from which you will gather that I did go past. PMD has Lapsang Sushong tea (great man! ), and after a pot of that I was ready to get to work, whilst he finished copying a new score that had to be delivered to Edinburgh the following week. Unfortunately, there was the matter of the keys to see to so, with a quick stop for a very good stew, then it was working through to 2.00am to get the organ to the point where I knew I could get it completed the following day, and then a bit of kip on the sofa. Next morning (well actually only a bit later the same morning really), a good breakfast and re-assembly completed and then tuning. That was the easy bit, and I was finished just an hour before I had to leave (with PMD and his score which is just as well as there ARE two roads when you go south and I would have missed the correct one). He played it a bit. The specification is a bit curious, but it does have its logic. 8 & 4 is OK, but then a mixture with no 2ft? That is the reason there is no quint in the bass of the mixture, until middle c in fact. The chorus works rather well actually and the brightness of it all together gives it a whiff of orchestral texture. The Regal is a mild one. The specification is Sir Peter's own and has proved remarkably flexible. It is tuned to Vallotti's unequal temperament. Back to the Bevans' at Stromness (a delightful little town where you drive down the main street wondering if it is going to be wide enough for the car - there are no pavements; we are talking about walls here - and then come across a car coming in the opposite direction!) They make all sorts of very good whiskeys in Scotland, the like of which (unless you are a real connoisseur, of course) you never hear of down here in the Smoke. Up early the next day (Tuesday) and in the hire car to Kirkwall airport, little more than a Nissan Hut really (leaving the car in the airport car park with the key inside it - where can you still do that?). Back to Aberdeen and then Heathrow and to work in the afternoon, the effects of the whiskey having just about worn off by then. 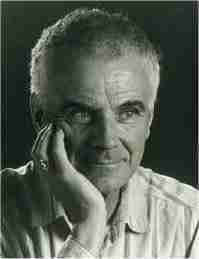 Peter Maxwell Davies is a fascinating person with very wide interests and not really anything like as hermit-like as one might expect of somebody who likes to take himself off the outer corners of the world to do his composition. He does not drive, so is more or less left to his own devices when at home. He composes at what seems to me to be a rate, the only noise being the regular whirring of an electric pencil sharpener to break the blissful peace. Last year he went to the Antarctic to compose a symphony, commissioned by the British Antarctic Survey in conjunction with the Philharmonia Orchestra. This Symphony (which will be No 8) will be performed in May 2001. The idea of the visit was to absorb the atmosphere down there. The commission is to celebrate the 50th anniversary of the making of the film of Scott of the Antarctic and the music that Ralph Vaughan Williams wrote for that film. RVW then took the music for that film and worked it into a symphony (his Symphony No 7), and Peter was at the first performance of that piece in Manchester, of course as a boy.